The historic Lot Studios has been around since the beginning of film, originating in the 1920s. Now, nearly a hundred years later, they continue to provide full-service studio space for TV, film, and commercial production. 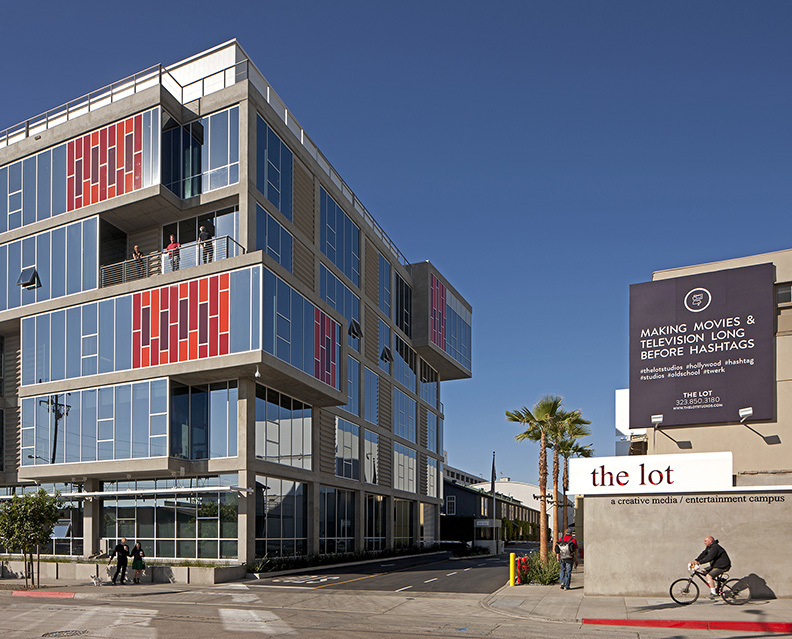 The Lot Studios occupies eleven acres in the heart of West Hollywood, and features seven sound stages, an on-site post-production facility, seven-level parking structure, upscale restaurant, and plenty of office space. We’ve been working with them since 2012, bringing a simple and modern touch to their aesthetic, both online and in print, as well as maintaining a clear, organized way to view and rent spaces. 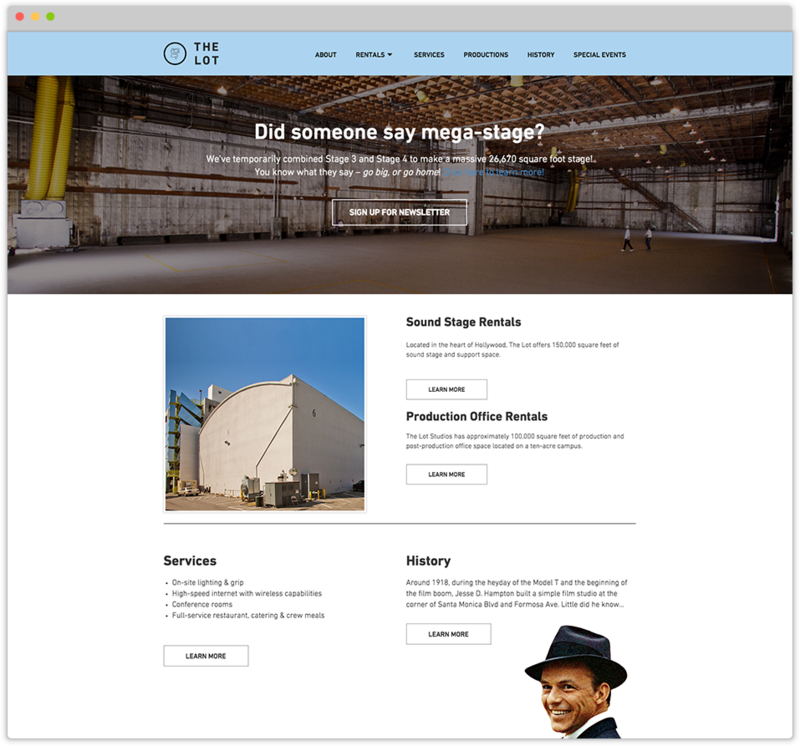 We’ve also enhanced their social media presence, making it easier for people to see that The Lot is top-notch for all production needs. When we started discussing their needs in 2011, The Lot already had a brand mark – the outlined circle with shapes inside. These shapes actually represent the outlines of some of the buildings on the property from overhead. The typeface that they were using for their name was incredibly dated and needed some refreshing, so we chose a simple sans serif that we thought had nice, strong lines, and presented a couple configurations that they could use to suite their needs. In addition to updating the typeface, we selected a color combination that was fresh and airy. You can now see this new logo on all of their digital and print assets, and even on the t-shirts that the staff wear! For visitors interested in The Lot's long and illustrious history, we created a responsive and touch-enabled interface. Big things are happening at The Lot! In 2015, the Oprah Winfrey Network (OWN) settled in to their new network headquarters on The Lot along with comedy video website and tv/film production company Funny Or Die. Each of these companies are proud to make their home on The Lot, and Heave Design is proud to support them in their endeavors. Interested in learning more about The Lot?